It is meanwhile a good tradition that Romantis Group will participate at this important exhibition with our own booth. Please be invited to visit us this year at booth #ZB2-C11 at Za’abeel Hall (ZAB-2), to learn more about our latest offers and solutions. Our company will demonstrate its solutions for fixed and mobile applications based on new generation satellites designated for the Middle East and African markets. Thus, Romantis will present wide scale of solutions including for example the next generation EpicNG HTS satellites as well as cost-efficient solutions using powerful Express AM-X satellite fleet. 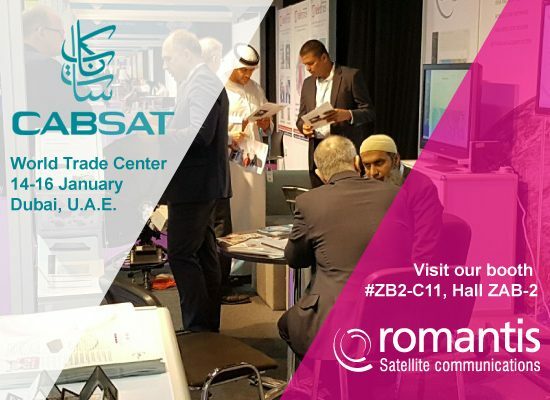 Whether you are currently working on projects for broadband Internet access, corporate networks, TV broadcast, cellular backhaul or COTM applications, Romantis is able to provide you the optimal technical and commercial satellite solution. With more than 20 years of experience, Romantis offers a lot of value added services including but not limited to network engineering, customized link budgeting, optimization of capacity usage, 24/7h monitoring and helpdesk services, and supply of state-of-the-art satellite router hardware. We are looking forward to meeting you at Cabsat show. Please contact us at your earliest and fix a meeting with us at a convenient for you date and time. We are looking forward to meeting you in Dubai in January.